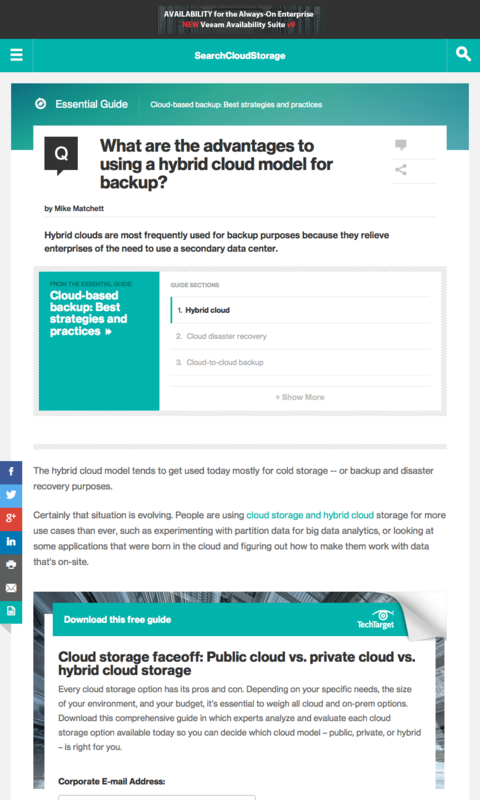 What are the advantages to using a hybrid cloud model for backup? Hybrid clouds are most frequently used for backup purposes because they relieve enterprises of the need to use a secondary data center. The hybrid cloud model tends to get used today mostly for cold storage — or backup and disaster recovery purposes. Certainly that situation is evolving. People are using cloud storage and hybrid cloud storage for more use cases than ever, such as experimenting with partition data for big data analytics, or looking at some applications that were born in the cloud and figuring out how to make them work with data that’s on-site. But today, they’re using it by and large as a cold storage tier. Using the hybrid cloud as a backup site is really a great thing because you don’t have to build a complete second data center or another off-site repository. If you just have one data center — or primary data center — you can take those backup images and put them into a public cloud. 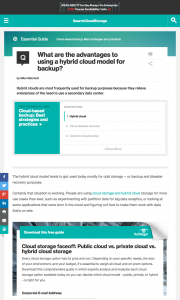 This entry was posted in Published Articles and tagged Backup, Cloud Storage, Data protection, Disaster Recovery, Hybrid, SearchCloudStorage, Taneja Group by Mike. Bookmark the permalink.